Grass pitch with stunning, open views of the nearby fells. Easy access to the shower block, laundry facilities and communal cabin. Pitch up in a secluded area of Gill Head Farm. The Quite Area is surrounded by slopes and trees, with a stream and waterfall. 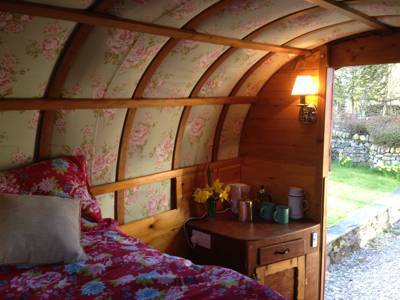 Our vintage gypsy wagon with traditional ornate paintwork and canvas bow top offers a special place to relax and unwind whilst enjoying the beauty of the Lake District. Gill Head is a lovely little working hill farm that’s been run by the same family for several generations. 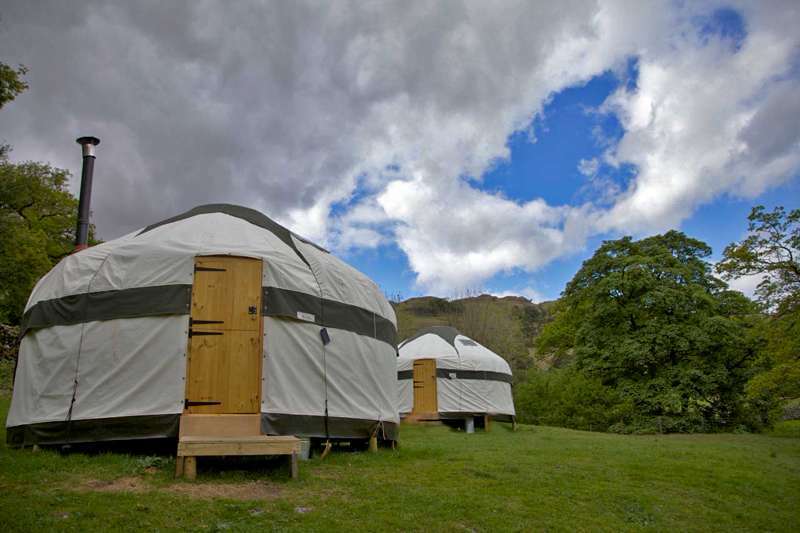 Ensconced within the Lake District National Park, yet far removed from the tourist hordes, it offers space for tents and caravans, as well as B&B accommodation and six rather funky timber camping pods. 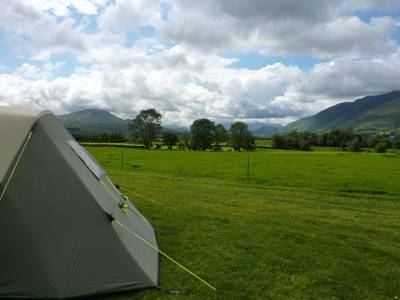 The main camping meadow is wide and flat with space for around 50 pitches (the 21 hardstanding caravan pitches are in a separate field), offering campers grand views to the mighty Blencathra – known locally ‘Saddleback’, a ridge of six separate fell tops – and Northern Fells, stretching right down the valley to Keswick. In keeping with the splendid, spacious location, the site has a laid-back, natural feel. 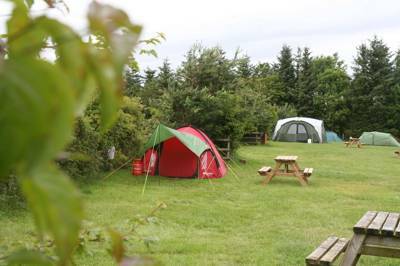 There are fields and streams to paddle in, an organised play area for children, and decent facilities that include a modern and spacious shower, toilet, and laundry block. There’s even a log cabin (with TV lounge and undercover BBQ area) for communal get-togethers and wet-weather relaxation. 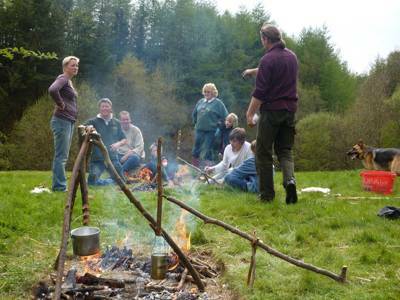 Beyond lie the Lakes and a wealth of hiking, biking, ghyll scrambling, and water-based activities (Ullswater is less than a 10-minute drive away) and the owners have been thoughtful enough to arrange regular onsite activities, games, and even bushcraft courses (run by local firm Reach Beyond Adventure). Those ‘who don’t want to feel like they’re on a campsite’, as the owners put it, can ask to pitch in the ‘hidden’ field, which comes with its own waterfall and steep, wooded banks. You’ll have to walk further to the shower block, but it’s a small price to pay for such pleasant, leafy isolation. 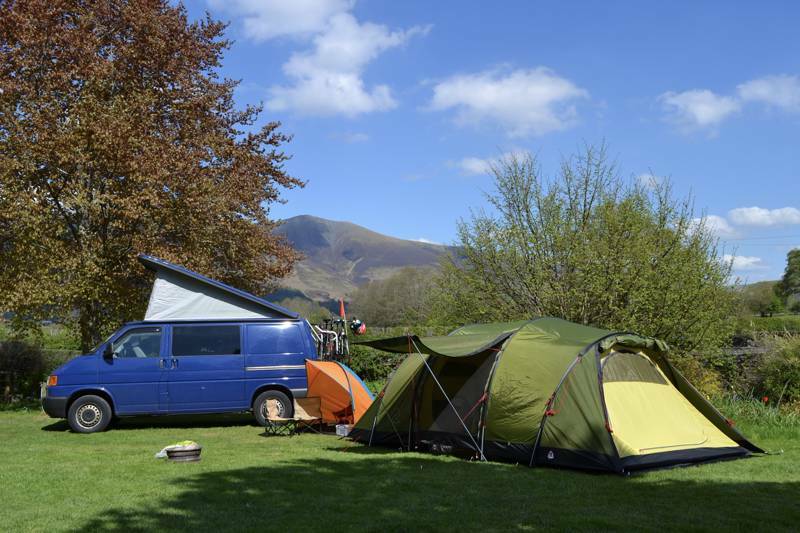 Gill Head Farm is a family run working hill farm, offering high quality farmhouse self cartering accommodation and caravan & camping accommodation set against the spectacular backdrop of Blencathra and the northern fells of the Lake District National Park. Whatever you are looking for from your holiday, be it excitement and adventure on the lakes and fells, peace and tranquility whilst sightseeing or strolling around stately homes and gardens, visits to country fairs, or an action packed family holiday. Gill Head’s location with it’s beautiful rural setting ensures we are ideally situated for a wonderful holiday within the Lake District National Park far from the madding crowds. For latest availability and best prices for Gill Head Farm, please use the Date Search above. 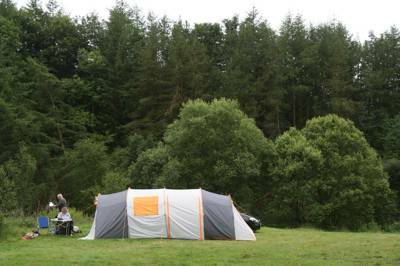 Camp in either the main field with gorgeous fell views, or the hidden field, with its own waterfall and wooded banks. Or try the vintage gypsy wagon with traditional ornate paintwork and canvas bow top. The surrounding area has some of the best walking country in the Lakes – ask on site for info and routes.Ullswater is a short drive away and being England’s second largest lake has a huge range of activities and water sports to offer, including sailing, kayaking, and fishing trips. The Rheged Centre (01768 868000) in Penrith has a number of retail outlets and cafés, lots of activities for kids, and a giant cinema. Rookin House Equestrian Centre (017684 83561) is a family-owned adventure venue with everything from air rifle shooting and archery to riding lessons and trekking. The surrounding area has some of the best walking country in the Lakes – ask on site for info and routes. 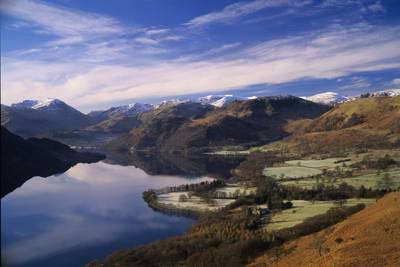 Ullswater is a short drive away and being England’s second largest lake has a huge range of activities and water sports to offer, including sailing, kayaking, and fishing trips. The Rheged Centre (01768 868000) in Penrith has a number of retail outlets and cafés, lots of activities for kids, and a giant cinema. Rookin House Equestrian Centre (017684 83561) is a family-owned adventure venue with everything from air rifle shooting and archery to riding lessons and trekking. The refurbished Troutbeck Inn (017684 83635) is within walking distance, with pricey but delicious food. The Mill Inn (017687 79632) in calm, unspoiled Mungrisdale serves good food based on traditional Cumbrian fair. Veggies will love the Lakeland Pedlar Café (017687 74492), an organic wholefood vegetarian café with beautiful views. 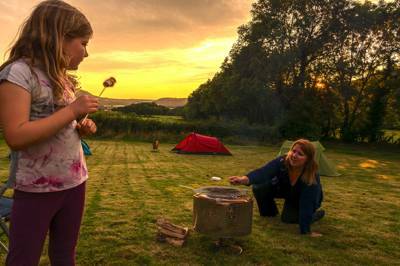 Camping: Adults £9 per person per night, children £4 and infants (under 5) are free. 3-night minimum on Easter and Bank Holidays. Gypsy Caravan £40 per night. Take the A66 towards Keswick. At the Troutbeck Inn T-junction take the A5091, signposted Ullswater. After 100 metres turn right for Gill Head. Train to Penrith or Keswick then bus no. X4 or X5 (every hour between Penrith and Keswick) to the Troutbeck Inn and walk the ¼ mile to the site.